Action and adventure await you in this epic battle game! 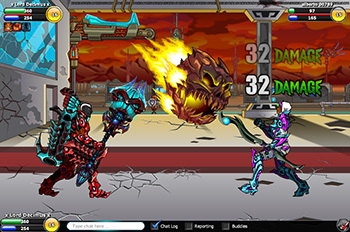 EpicDuel is a free to play browser MMORPG featuring PvP (Player vs Player) combat. Turn fantasy into reality by creating your custom character to fight your friends in turn-based real time strategy battles. 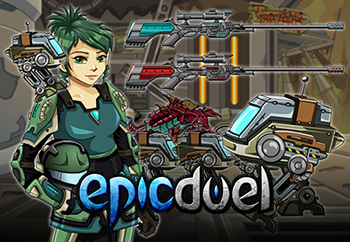 And the best RPG gets better with new releases launching every week, so stay tuned to the Design Notes for behind-the-scenes MMO information and become the most epic dueler in all of EpicDuel! Power Up your Online MMO Character! Bring your RPG strategy to the next level! When you harness Varium crystals, you gain access to powerful weapons, advanced armors, and unique styles in browser based glory. Varium also lets you create factions, customize your home, and gain an advantage on the PvP leaderboards! 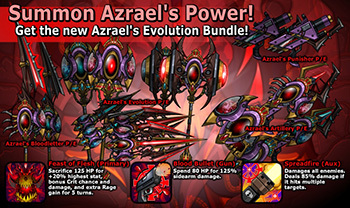 New Azrael's Evolution Promo Package! The Omega Wolf Pack has retreated to it's wintry den to make way for Azrael's Evolution! Get 8 awesome new weapons in one pack complete with powerful new cores! Spreadfire (Auxiliary): Damages all enemies. Deals 85% damage if it hits multiple targets. Feast of Flesh (Primary): Sacrifice 125HP for 20% to highest stat, bonus Crit chance, and extra Rage gain for 5 turns. Blood Bullets (Sidearm): Spend 80HP for 125% more sidearm damage. Want something for your collection of seasonal weapons that's a bit less bloody? Visit Bido in the Afterlife to collect a brand new set of Radiant Heartbreaker Weapons! 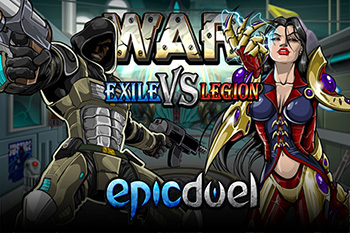 You are an epic dueler online… now become an epic dueler in real life! HeroMart has the best RPG t-shirts, toys, books, and bundles to put the WAR in your wardrobe. 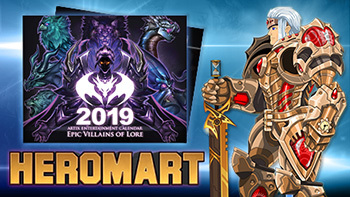 And HeroMart items come with exclusive in-game items for your favorite MMORPGs like EpicDuel and AdventureQuest 3D. Fight for order under the Legion flag or battle for freedom under the banner of the Exiles. Join a Faction or create your own, complete with a huge private headquarters, customizeable flag, and live messageboard! Plus, you'll be able to participate in War events and duel to dominate all of Delta V and earn rare War prizes! It's a big world out there...time to conquer it! Rain down showers of meteors, mutate into vicious beasts, or demolish your opponents' defenses with epic cores. These amazing enhancements can turn even the most basic arsenal into an engine of relentless destruction! Visit the interesting merchants of Delta V and browse their vast inventories of THOUSANDS items. Bunny-headed bazookas, space blasters, laser rifles, ninja claws, cybernetic blades, alien staffs, bionic mutant allies...you never know what treasures you'll find in EpicDuel's weekly releases! Want to browse some of the treasure that await? The EpicDuel Wiki has you covered! 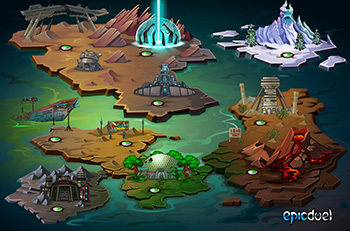 © 2019 Battleon EpicDuel, LLC. All Rights Reserved.